I wanted to show these two custom wedding bands together, so I’m squeezing in the Jewel of the Month for March just in the nick of time — alongside the very belated Jewel of the Month for February. 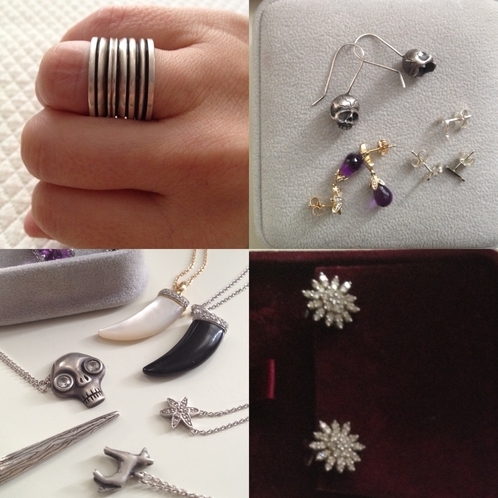 I still sell the skull designs, the silver studs, and the vampire stake necklace (glimpsed on left side of lower-left photo). Everything else is discontinued. I’m always especially happy and honored to help create wedding jewelry. 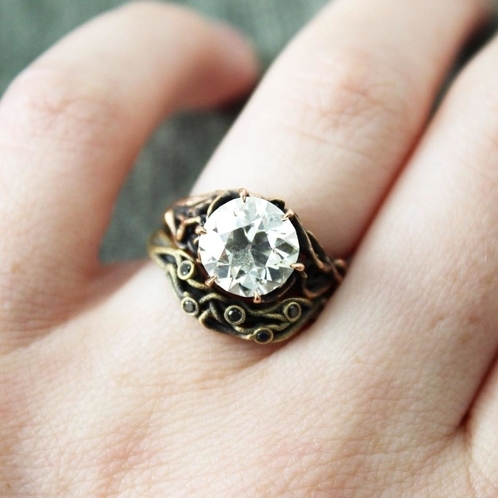 Last year, I made this engagement ring for my right-hand woman Eryn. My right-hand woman’s left-hand ring! Click for original post. 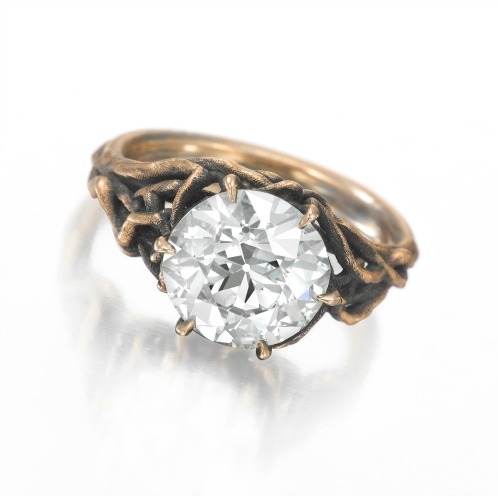 This was a redesign of a family-heirloom diamond ring. The video shows the before (grandma’s style) and after the redesign (Eryn’s style). This photo shows Eryn’s 18K yellow-gold wedding band stacked below the 18K rose-gold engagement ring. I love the band stacked on top, too. Wedding ceremony photo by Kayla Rice. Click for original post. … and her engagement ring on her right. Wedding ceremony photo by Kayla Rice. 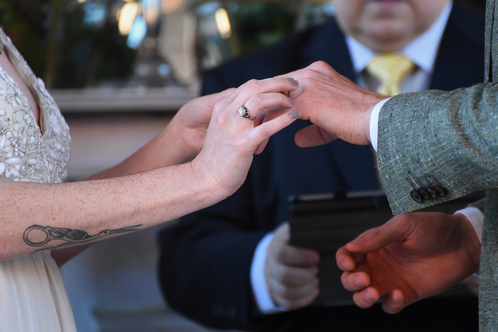 Both Eryn and Donnie first saw their wedding bands as the bands slid onto their fingers during the ceremony. 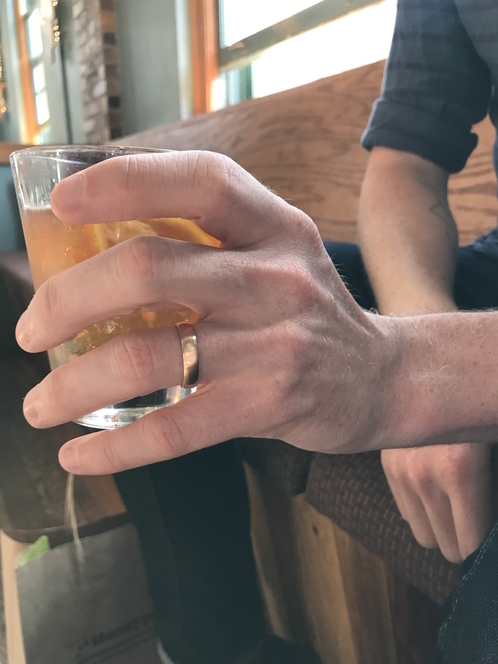 Donnie, who was initially worried he wouldn’t get used to wearing a ring, says, “When I first saw it, standing in front of nearly 100 of my closest friends and family, I remember being shocked by how much I loved the weight and finish. The ring felt substantial while still feeling like it had always been there.” Aw! That’s perfect. 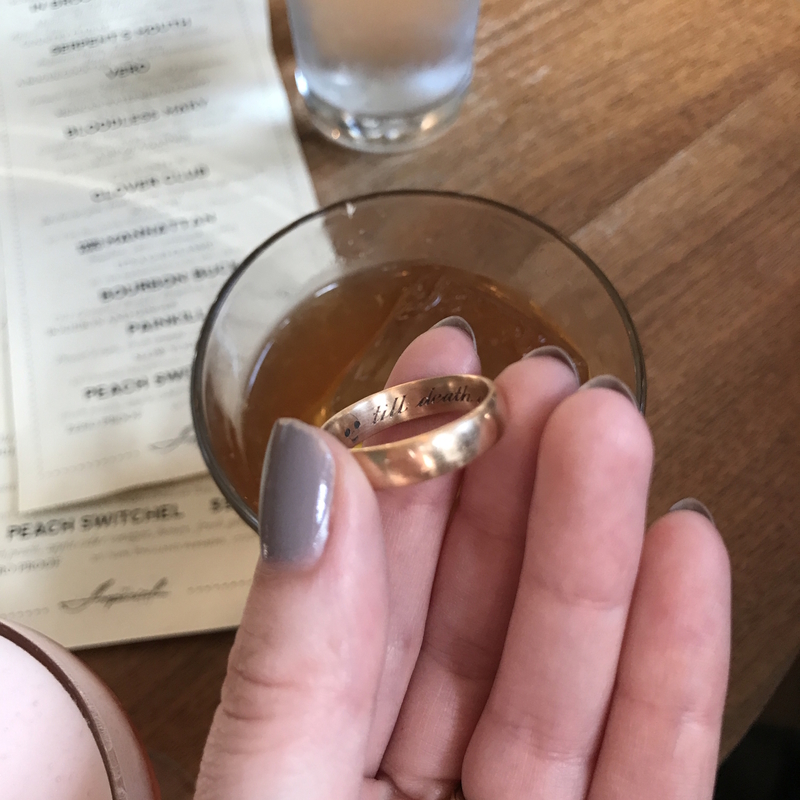 It’s also a good of example of something I’ve said before: A recipient of one of my engagement rings or wedding bands can request a particular design, down to the tiniest detail, and the significant other and I can still figure out a way to make it a surprise. There’s no need to risk getting a ring someone doesn’t like just to create suspense. 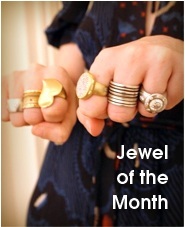 So, go ahead and ask for your beloved’s input on jewelry! In fact, Donnie got a second surprise at the wedding reception when Eryn showed him the inside of his ring. She put a lot of thought into creating hidden details, which included an inside joke. “I had ‘Till death do we vinagrette’ engraved because “vinaigrette” is the word I misspelled while playing trivia the very first time we met,” she says. She punctuated this thought with a skull engraving and two black diamonds. It’s hard to photograph the inside of a ring outside a professional studio! Click to enlarge. All the plotting paid off. Eryn reports that since Donnie said, “I do,” “he hasn’t taken his ring off. Ever! He loves that it has a worn look to it now, dinged up from playing sports and tapping it on cocktail glasses. When he first received it, he would rest his chin on his left hand to show the ring off.” Woot! That’s what I like to hear. Most of the time, when people say they don’t like wedding jewelry, it means they haven’t been exposed to truly custom design. They might know the “pick one from each category” version of customization, where you go to a store or website and choose a metal, a mass-produced setting, and a gem or gems. 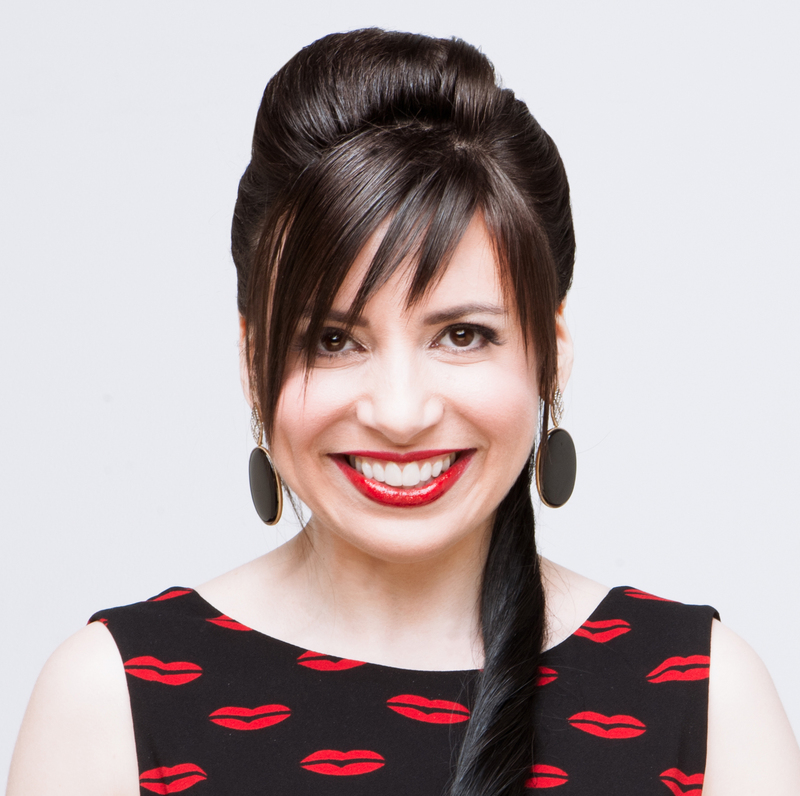 I start from scratch, so you can have absolutely anything you want — or anything your bride-to-be wants, at least. 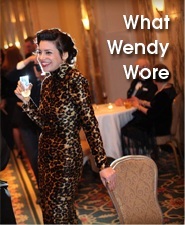 To inquire about custom wedding jewelry, email me at info at wendybrandes dot com. Don’t be shy about reaching out! While my price for any true custom piece will obviously be higher than that of pre-made, mass-produced jewelry, I work with a wider range of budgets than you might think. 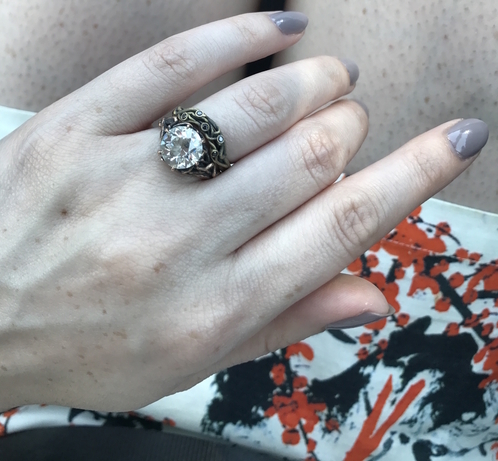 I have a soft spot for wedding jewelry and I feel like everyone who wants to have a unique design should be able to get one if at all possible. To choose from my small collection of limited-edition, non-mass-produced semi-mounts (my special version of the “pick one from each category” ring), check out my Wendy Brandes Wedding collection. VIEW MY WEDDING JEWELRY HERE. You can also watch a video about my wedding designs on YouTube.